Even before the Revolutionary War, the North and South had cultural and geographical differences. As the years went on, these differences became larger. From the 1820s to the 1850s, bustling cities sprang up in the North. Workers came to these cities to work in factories making cloth, furniture, watches, tools, and other items. Many people in the North opposed slavery. By the end of the 1700s, slavery was illegal in most Northern states. Over 250,000 free black people lived in the North. Some of them had been born free or given their freedom. Others had bought their freedom or escaped from the South. Men became wealthy building factories and railroads. Most of the railroads built during this time were built in the North, which gave the North an advantage over the South. Factories in the North could ship their goods to people living in the West and Midwest. Factory workers – many of them, young women – came from farms to the cities. Initially, many factory owners took good care of their employees, offering them safe, clean housing and education. Company owners became greedy though and wanted to keep their profits. Factory workers often worked long hours in unclean and unsafe conditions. In Ireland, a potato famine caused widespread suffering and death. Thousands of people immigrated to the U.S. from Ireland and Germany. These people were desperate for work and accepted the low wages and poor conditions found in the factories. If someone complained, they were fired. Abolitionists passionately wanted to end slavery. Abolitionist and writer, Harriet Beecher Stowe, wrote Uncle Tom’s Cabin, a novel that depicted life for Southern slaves. The book sold 300,000 copies in just a few months and motivated Northerners to fight more vocally for an end to slavery. Question: Did white people welcome free blacks to the North? Answer: Some did, even going so far as to offer safety and shelter to slaves escaping from the South. But blacks were often discriminated against in the North. They created their own neighborhoods, schools, businesses, and churches where they would be safe. Visit the Civil War Trust to learn more about the differences between the North and the South. Declan, Tobin. " Civil War Fun Facts for Children ." American History for Kids, Apr 2019. Web. 22 Apr 2019. 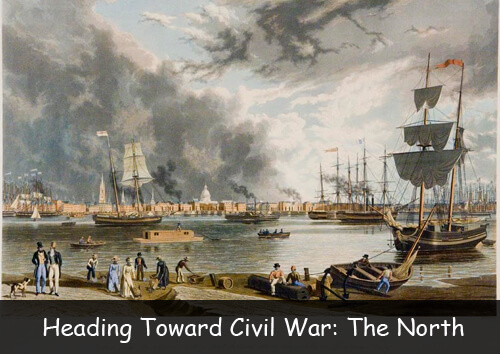 < https://www.americanhistoryforkids.com/heading-toward-civil-war-north/ >.